King size bed suite, ensuite with bathtub and shower. King size bed stateroom, ensuite with shower. King size bed stateroom, ensuite with shower. Double size bed stateroom, with an additional single sized bed and pullman berth, ensuite with shower. Twin stateroom (two single sized beds), ensuite with shower. A FULL COMPLIMENT OF WATER SPORTS EQUIPMENT WILL BE ON BOARD. 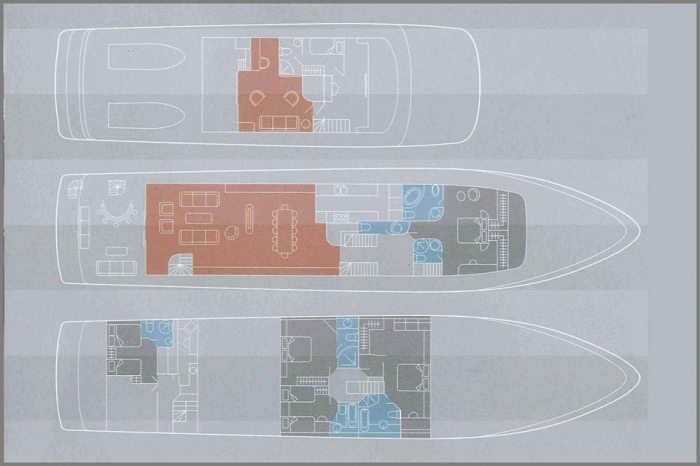 THE YACHT WILL INCLUDE A 7M (23') TOWED TENDER WITH 200HP OUTBOARD ENGINE, 7.5M (24') MELGES PERFORMANCE SAILING BOAT AVAILABLE (VIRGIN ISLANDS ONLY), WATER SKIS (ADULT & CHILD), TOWABLE TOYS, 2 X SEA KAYAKS, 2 X 3-PERSON 2013 YAMAHA VXDELUXE WAVERUNNERS, 2 X STAND-UP PADDLEBOARDS, SNORKELING GEAR, FISHING GEAR, 4 X CAYAGO F7 SEABOBS. LATEST TOY THE 'JETSURF' - THE JETSURF IS A JET PROPELLED SURFBOARD, WEIGHING JUST 12.5KG UNLIKE ANY PREVIOUS MOTORIZED BOARD, THIS ONE CAN BE EASILY CARRIED DOWN TO THE BEACH, BY A SINGLE PERSON AND HANDLES LIKE A TRUE SURFBOARD. EXERCISE EQUIPMENT AVAILABLE UPON REQUEST, DEPENDING ON LOCATION. THERE IS A JACUZZI ON THE SUN DECK WITH BUILT IN SUNBED SURROUND.